-Breakfast! Includes: Cereal, milk, toast, cheese, coffee, tea, serving of diced fruit. We are located one block away from the subway (Metro) station Salvador, which is in Providencia, a really friendly, safe part of town. We are also conveniently situated between two of the best neighborhoods for experiencing Santiago's energetic nightlife scene. 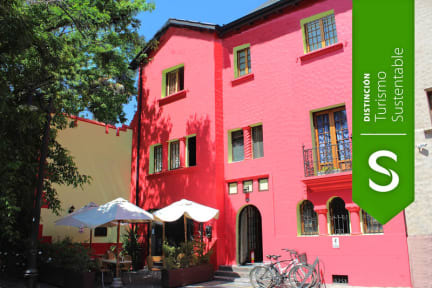 The best of Santiago's restaurants, bars and clubs are all within walking distance and also supermarket and exchange offices. Don't worry about spending too much money on taxis because even at night you can walk around without being afraid. We are happy to help you with anything that you may need, including information about Santiago's sights and activities, and making transportation from the airport, also travel and tour arrangements. -Spanish courses with our partner Tandem school. If you want to enjoy your stay even more, check out our special deals at the top of this page. Will be waiting for you!! Based on local tax laws, all Chilean citizens and resident foreigners must pay an additional fee (IVA) of 19%. To be exempt from this 19% additional fee (IVA) the payment must be made in US dollars and a copy of the immigration card and passport must be presented. The passenger won’t be exempt from this fee when paying in local currency. If you pay by credit card an additional 4.5% must be pay, because the use of the bank machine. In case of no show the invoice will be billed in local currency, including this additional fee (IVA). This additional fee (IVA) is not included in the hotel rates and must be paid separately.